Here are three of my favorite photos. Threre is one each from Bald River Falls off the Cherohala Skyway, Elizabethton, Tennessee and the Alberta/Saskatchewan border. The photos may not be technically brilliant but they do represent three of my favorite places. I'm posting the photos from these spots as a way of saying thanks. Without you, my travel to the Cherohala Skyway and Syamore Shoals in Elizabethton, Tennessee would not have been possible. Never did I think that my dream of driving the Alaska Highway and seeing the Alberta and Saskatchewan border would actually happen. It did and you are part of the reason why. In the meantime, here are three of my favorite photos for you to enjoy. Bald River Falls isn't far off of the path to the Cherohala Skyway. The bridge for the roadway goes right in front of the falls. Standing at the rail puts you close enough to feel the spray on your face.You can stand there for an hour and be completely mesmerized by the sound of the falling water. See the family swimming in the water? They're in the bottom left corner. 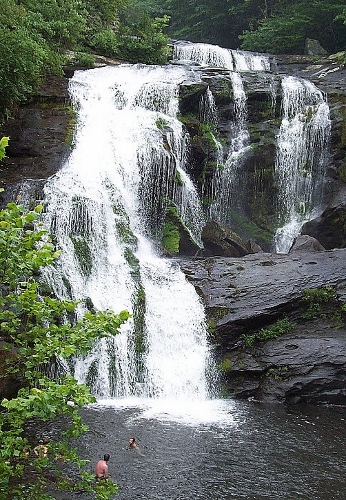 Compare them to the size of the falls to get an idea of the scope and grandeur of Bald River Falls. I was at Sycamore Shoals State Historic Area in Elizabethton, Tennessee when this shot was taken. A loud "boom" rocked the area as we pulled up to the vistitor center. By the time the air rattled with the second blast we knew that we were in luck. A colonial reenactment was going on and we were there just in time to see the demonstration. It was raining when I took this photo of the Alberta and Saskatchewan border. However; that didn't dampen my enthusiasm for being there. Like I said earlier, this isn't the most technically advanced photo of my career but it marks an important point in the longest road trip of my life. My daughter and I were on our trip of a lifetime when we drove from our home in Tennessee to Fairbanks, Alaska. She and I had a brilliant time driving across Canada. Our goal was to help with a mission team in Willow. We did that, traveled to Denali and on up to Fairbanks. We also saw Seward, Anchorage and we drove the Cassiar Highway. If the opportunity opens again, it will take me 30 minutes to pack my bags and head out the door. There are tons of other photos and funny moments to come soon. I'll also continue to post current, relevant information that you want. Thanks for being a part of You've Been Reviewed. I look forward to sharing with you and to hearing your suggestions for years to come.